The main identifying doll mark for Mattel Barbie dolls and friends is located on the dolls buttock (modern dolls the mark is on the lower back, at the waist). There are additional numbers on the inside arms, inside thighs, the back of the heads on the neck rim; these were probably manufacturer part numbers used to assemble the dolls and do not have any importance in trying to identify the Barbie doll or year it was on the market. We counted sixty actual vintage dolls marked 1966 and sold from 1967 to 1976. There are many, many Barbie dolls made from the 1980s to present with a 1966 date in the mark ( 1966 is the date the patent was registered in that particular country), for these modern dolls, use the table below to see when your doll was actually made & sold. © 1966 Mattel, Inc. U.S. & Foreign Patented Other Pat's Pending Made in U.S.A.
U.S. Patented U.S. Pat. Pend. ** Note: TNT = Twist N turn doll waist Malibu = Sun Set Malibu. 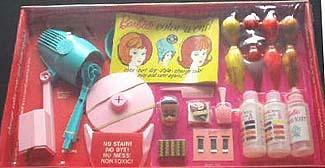 4038 Barbie doll Color N Curl set 1965 - Same as above set. 4035 Barbie doll Color N Curl set - Same as above set - add one Midge head. Early 1966: © 1958 Mattel, Inc. U.S. Patented U.S. Pat. Pend. (Raised) Made in Japan. Late 1966 all letters were raised.